Rain and fog and phew.... No trouble in train to Southampton but not quite up to Swiss railways. Have coffee at Southampton station where staff and service very good. Talked to a singer going to work in the Oriana who was a mind of information. Check in procedures at Southampton was in a converted banana warehouse and was very well organised. Well done P & O. On board and camped in restaurant. Sal still not aware that John & Deirdre joining us. Send text to John to let him know where we are and the surprise on Sal's face was something to see. Only our 3rd cruise and the first escape drill we have attended being late for the other two. What a great shame the British weather did its worst - it would have been a fantastic sight had it stopped raining. 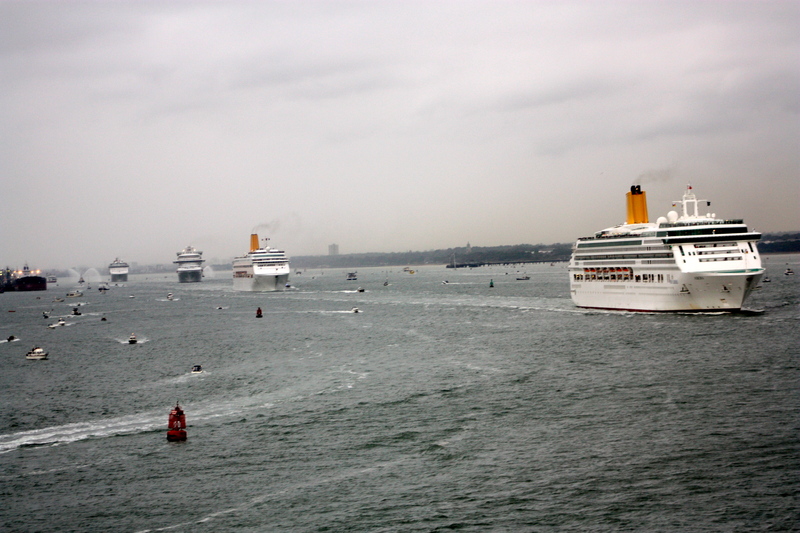 But, the sight of the 7 cruise ships all sailing down the Solent was spectacular from on deck. The crowds of people who had stood out in the rain must be hardy souls but would have had a fantastic view. So many crowds at so many places including on the Isle of Wight where the Princess Royal took the salute and the Cowes sailing club's gun gave each ship a salute. Not convinced Princess Royal was actually there as couldn't see anyone. Bet she was tucked up in her stables somewhere. By the time we retire at 11:30 no one else up. We are obviously dirty stop ups. Woke to sound of fog horn – not an encouraging sound. Difficult to find table for breakfast – everyone had the same timing ideas. Morning talk on Reykjavik and afternoon talk on Isafjordur. Had a cat nap during talk on stars and the night sky. Speaker passionate about his subject but still I still managed to fall asleep. Sal went for swim in pool but sea has now got a bit rougher as we have turned and now are sailing up past Cornwall up the Bristol channel. In rough weather, the pool has it’s own wave machine which was interesting to watch; an weepy ear was a good excuse not to go in. Still only doing about 10 knots. Why so slow? Dublin. What a busy port and a good day in store. Crowded city not helped by a Stone Roses concert on the same night. 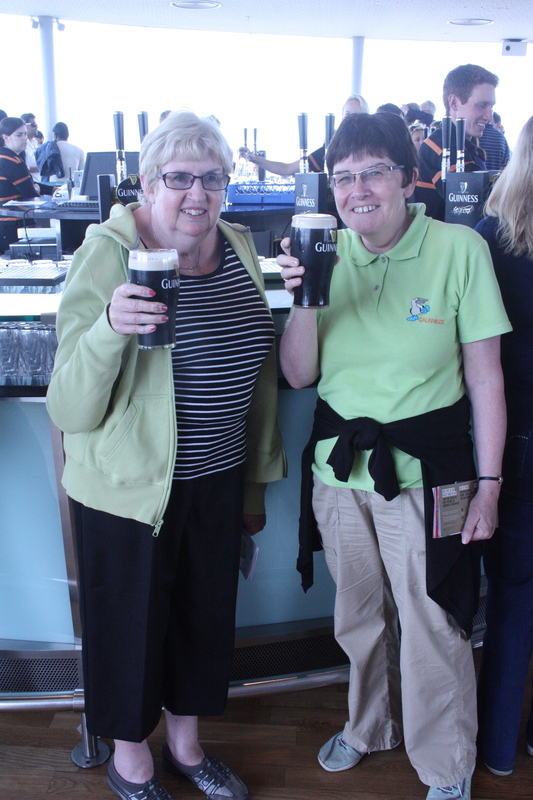 How come Guinness have managed to show off their factory without actually us seeing anything happening? Given that though, the view from the observation tower drinking the free drink was good. Red bus tour around the city entertaining but overpriced in my opinion. 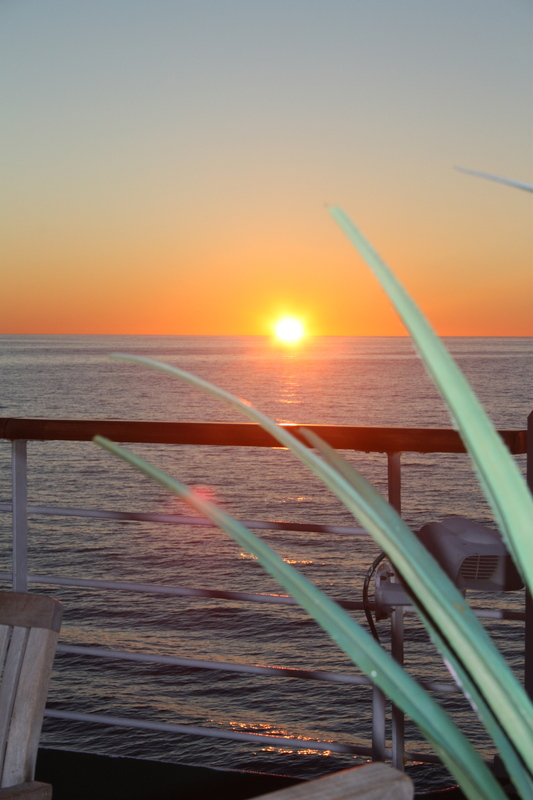 Back on board for a lovely sunset*, moon rising and calm seas. Will pass IOM at 2:30am tomorrow so not waking up for that. Quiz on adverts went ok but Murray mints would have got us another point, Sal as they aren’t “a minty bit stronger”. * Bearing in mind sunset off Iceland on night of 9/10 July this was pretty ordinary but bearing in mind the weather so far in the British Isles this year, it could have been the best yet! A day at sea. Walked for over a mile this morning around ship (4 laps) after breakfast as weather begins to deteriorate with a Force 5 forecast. Talk by Bill Tidy excellent – such a talent who took the mickey out of the ship and the weather. Cartoons were excellent and it just shows what a talent he is. He certainly didn’t like the coat hangers with no hooks! Captain came to talk to us at the reception prior to dinner which was surprising as he only managed to talk to about 4 or 5 couples. Weather and sea state now up to a Force 8! Waves high and boat rocking. A few casualties who didn’t turn up to dinner. Excellent show on the musicals but have you ever watched a stage show in a Force 8? Not a particularly good quiz result but enjoyed it. Must have reached Force 9 by the time we went to bed. One of the other couples on the table failed to show for dinner – bet they were ill. The second day in a row at sea and at least the weather is now better with no swell and some blue sky. Played tennis for probably the first time since I lived in Steyning in the late 80s. Not bad and even managed a few spinners. Golf not good as practice tee shots not possible because of an overhanging wire. Missed a talk on the aftermath of the Titanic which was apparently very good but needed a rest. Mile walk after lunch a and then a sleep before dressing up again for our evening meal. Yes, one of the other table members was unwell last night and was in bed from 4pm until 8am this morning. Our first tour. Blue Lagoon and a bit of Reykjavik. First stop was the house where Reagan and Gorbachov met to end the cold war. Then on to a water place where hot water is stored. 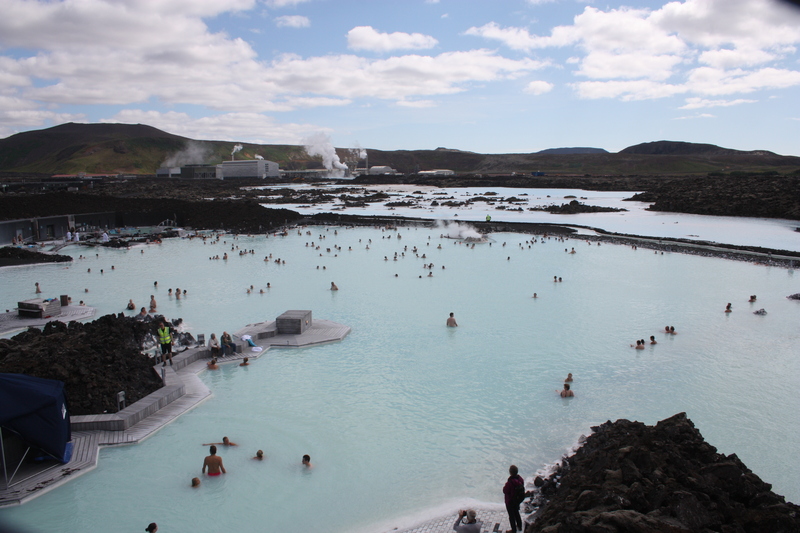 Iceland uses their hot springs to heat all homes which cuts down everyone’s electricity bills. Sights from top of building were good. Off to Blue Lagoon and Internet access at long last. Drive out is through a sort of lunar landscape that the American astronauts trained on. Blue Lagoon is in an oasis near a power station probably about 20 miles from Reykjavik, the water being unbelievably warm and obviously popular with locals and tourists alike. Last back on bus as tourist shop slow in serving previous customer. Back to Reykjavik and got off in town to look around. Lots of tourist shops all selling the same thing at the same prices. Looked round city hall which had a good cafe and a relief map of the island which was amazing and took 4 people 4 days to make and can be removed for functions and put together again. Not much else to write home about Reykjavik but outside the city, the houses looked modern and the whole area was clean. Didn’t get to go in the cathedral though, that may have to wait until another time. Sort of stiff arm today, so probably to do with the tennis yesterday – the first time i had played for close on 25 years! Andy Murray in Wimbledon final but will he win. 2 sets to 1 down as I type this. A gloriously sunny day but cold. Isafjordur is a very small community in NW Iceland and this is Arcadia’s first visit – it towers above the village but is dwarfed by the surrounding hills. No TV satellite signal we are told as we are so near the mountains. Looked around the outside of the museum which is housed in the three oldest house in Iceland. Managed to catch up with e-mails in a cafe but still cannot send e-mails. Sal & Dierdre had a good afternoon and dinner / evening concert followed. Still not a cloud in the sky and stayed up to sunset at 00:40 the following day!! Lots of pictures taken after midnight of the sun setting but as no clouds, not overly photogenic but so atmospheric. A few dolphins and whales seen from the ship but not particularly close so no good pictures. Another cruise ship passes us going the other way but probably 3 – 4 miles away so no chance of knowing what it was. Akureyi. Another clear day but very cold with temperatures no higher than 50F! Off to Godafoss waterfalls this morning so an early start and that after a late night watching the sun setting! Probably best described as a mini Niagara falls but none the less, interesting. 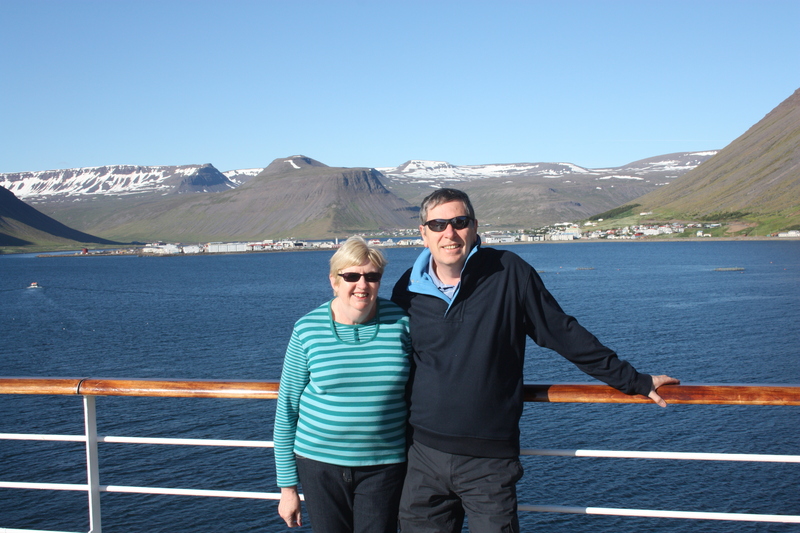 30 minutes drive from Akureyi which we are told is Iceland’s 2nd largest city. 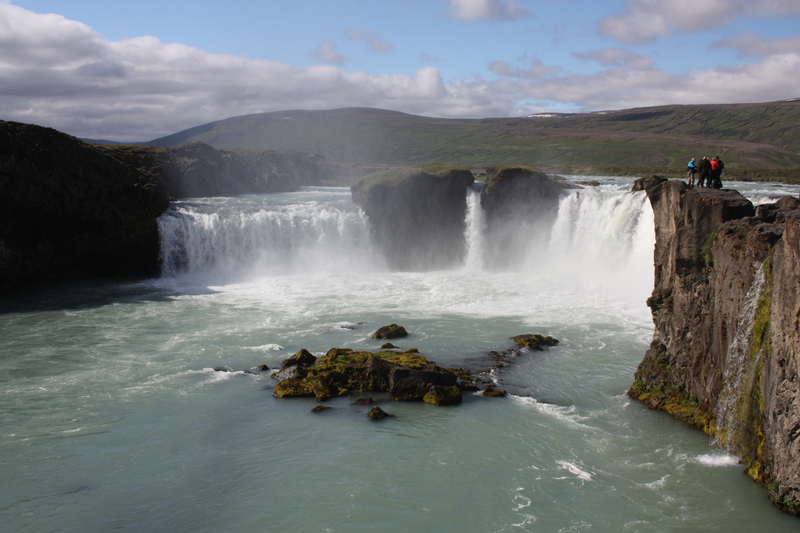 Good guide and some interesting scenery unlike Reykjavik. Stop at gardens on way back which is staffed by volunteers including youngsters who don’t have jobs. (Unemployment has fallen from 10.5% to 5.5% over the last four years.) Out to the town after lunch but not a lot to see here apart from some interest costumes hanging up in the street and some kids promoting running up the steps up to the church – gave that a miss. Bought some presents but not a lot of variation in choice and that was Iceland. I was impressed but maybe I was biased by the exceptionally good weather. 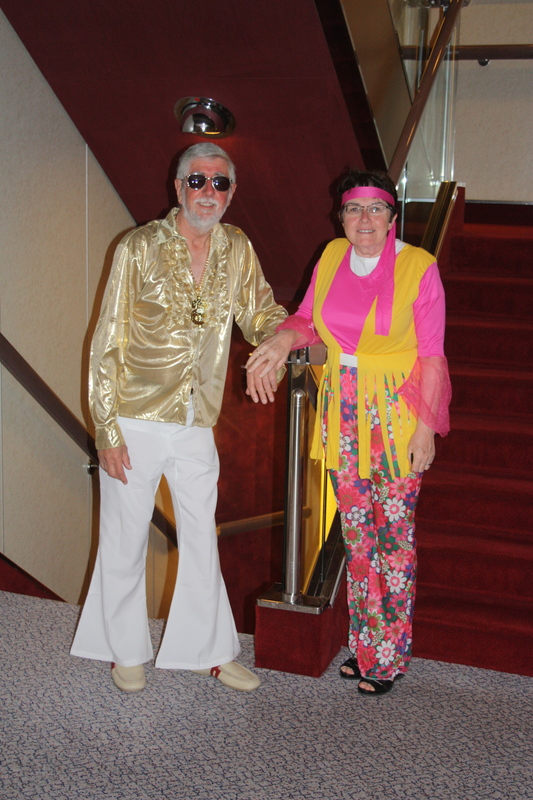 Themed night tonight was a 70s night and the only real participants were John & Dierdre in their fantastic 70s outfits. Clocks forward again tonight so early night was envisaged. That was not to be as a visit to the cafe to get a biscuit resulted in a late stay watching sunset and into the bargain a pod of about 5 dolphins and at least 2 whales. Sunset about an hour earlier but we are going East so that isn’t surprising. Not quite as clear as last night as a few whispery clouds. Ship managed to scare some birds away that looked as though they were incapable of flying and just scurried across on top of the water. Fish or birds? A day at sea and a chance to catch up with rest as going outside was not a good idea in view of the strong winds and relatively high sea. Afternoon watching an interview with Bill Tidy who was hilarious. Another excellent evening show with the Headliners group but something obviously went wrong as the 2nd sitting’s show had to be cancelled due to an injury and illness. Cloudy by now and a tad rough ( probably a force 7) so a relatively early night with clocks going forward another hour. That is one hour forward in each of the last two consecutive nights. Another country today – Norway. Including the UK, Norway is the 4th in 10 days and, including our Switzerland trip, 6 in 24 days. Both Norway and Iceland were new on the list of countries visited. 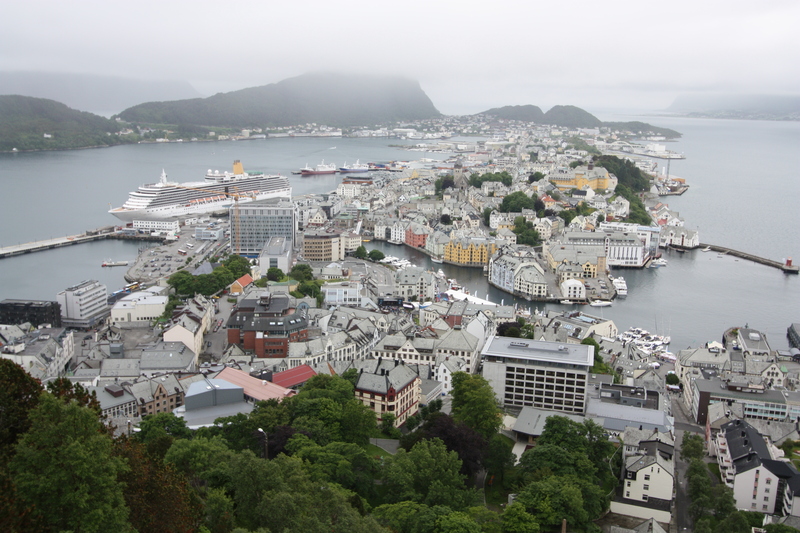 Alesund is a small (40,000) town but this morning it is disappointing as it is cloudy and drizzly. A walk into town in the morning around a market but not a great deal to tempt shoppers unless you want to buy a troll or some t-shirts which would fail the censorship police have a preponderance of f words. Never mind, we have a trip up a fjord this afternoon. It is such a shame the cloud is down and there is not a lot to see above about 200ft from sea level. Coach took us up to an observation tower but although tour guide said Norway is the most wealthy country in the world, the access road left a lot to be desired. A large waffle with cream and jam awaits our tour – delicious but probably not the best for diabetics. A large I.o.M registered vessel was in the harbour (Mary Jane) owned we were told by a wealthy Italian but a later visit to the town to see a music show was disappointing as it was not free entry. No skiers on the Shute that had been set up for entertainment for a festival that was in town and accounted for the market stalls. Geiranger beckons and as we tower above what looks like just a hamlet we wonder if we have made the right decision in going to the roof of Norway as the cloud level is probably Down to 300ft max. 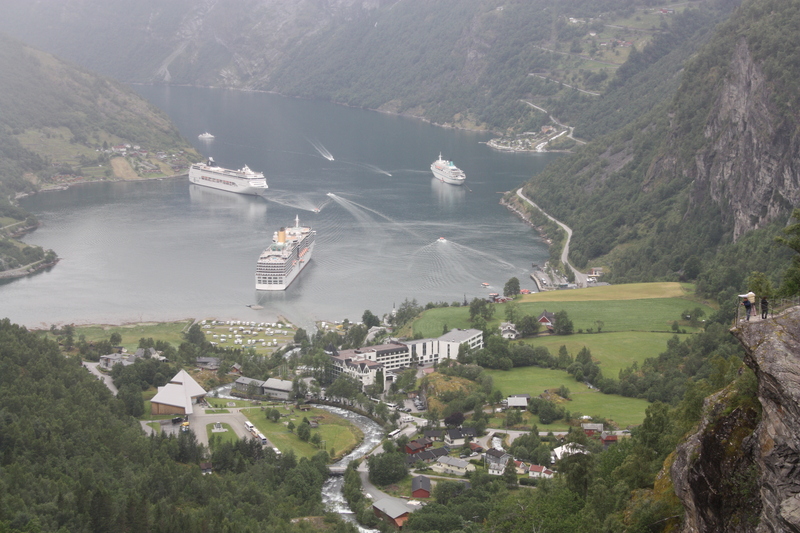 Geiranger has a winter population of about 250 which increases to 450 in the summer but sees about a million visitors pass through it each year. They have it down to a fine art. A tender disembarkation today and we are whisked off to our coach. At least we are not in coach 13 even though today is Friday the 13th. Our guide today is Italian which is strange and even stranger is that he has being doing the job for 5 years and speaks virtually no Norwegian. A front seat behind the driver (thank you Dierdre) has good views but on the hairpins you do feel you are hanging over the edge – shades of The Italian Job. 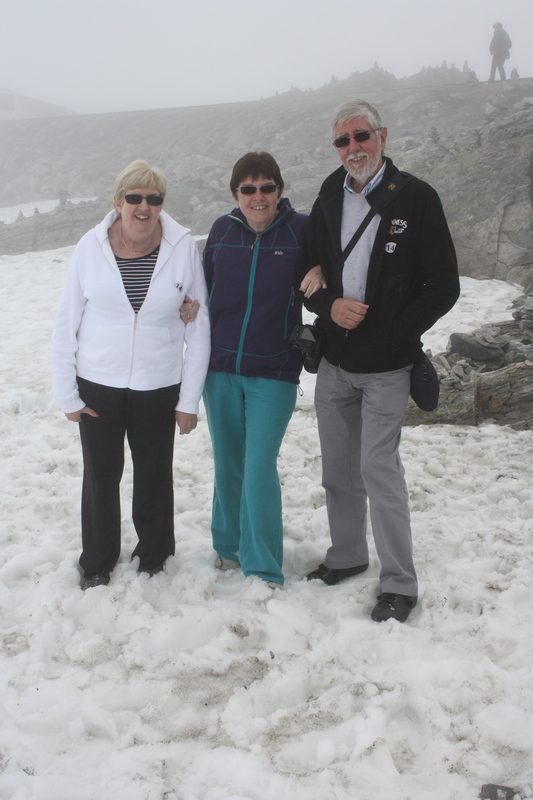 We are told that the snow has lasted longer than normal this year which is probably why when we get to the Roof there are still snow drifts bigger than our height and at least one lake is frozen. Sun glasses would have been useful here me thinks. Still patchy cloud but enough clearance to allow us to stop at a few places for photos. One place is a summer ski resort that is closed in winter! The road is impassable between October and May would you believe but this year the snow has stayed longer than normal. All set to leave and Arcadia seems to have a standoff with a German vessel but it was all to do with a faulty anchor and we are an hour late leaving. Missed most of the fjord but did get a view of the seven sisters whilst we were getting ready for 1st dinner sitting. Bergen. A bustling little fishing village but totally overrun with tourists! Ship put in the commercial port much to captain’s annoyance. We go into town and do the touristy bits at the quayside. Queue for funicular far too long so give that a miss and instead take “le petit train” which has a pit stop by the funicular’s midline station. Still good views though and we have gone up so many Swiss mountain railways last holiday so not disappointed not to get to top. 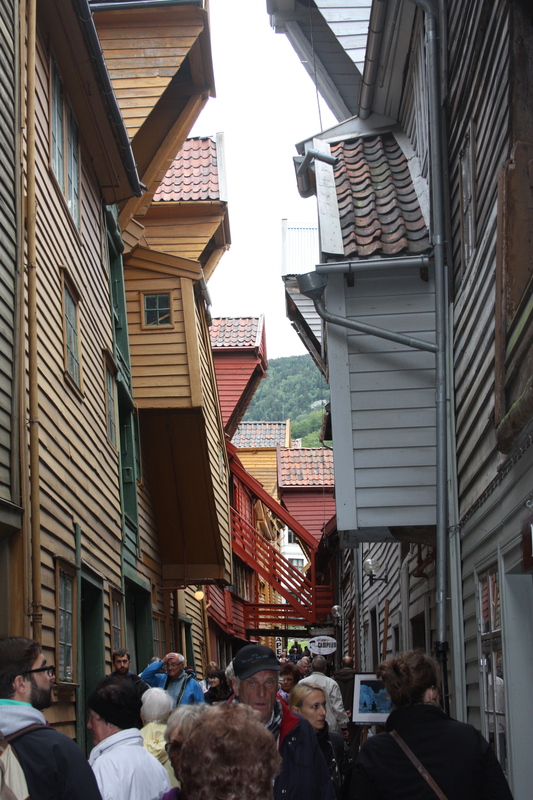 Old wooden buildings area (Bryggen) is fascinating and another UNESCO site but again, teeming with people. Expensive cups of not particularly good coffee that worked out at about £3.50 each. Sal bought a nice outdoor coat at 498kr which is about £55. Young girl in the shop knows just what to do …… for tax refund, which is about £9. Get offered a job in shop by a Russian girl but can’t speak German so I’m no good. The fact that I can’t speak Norwegian is obviously not a problem but then they only wanted people who could at least communicate in Norwegian as not many visit the shop! Starts to rain so back on board for lunch, passing crew members congregating outside TGIF Fridays with their laptops using the free wi-fi. Understand later that even a tour party had to queue over an hour to get on the funicular so glad we didn’t go for it. Get told in Crow’s nest to put my jacket on ……. Ugh. Flipping dress code. This is just like walking around a ghost town. Nothing is moving, no shops open and no one about this little town which is an attractive mix of old clapboard buildings and new modern ones. We couldn’t even get in the churches, how odd is that! Why do two very large cruise ships (2000 px each) plan to visit such a sleepy town when nothing is open and you can’t even get into the churches to look at them! Supposedly, the Cathedral has a connection with Winchester cathedral, something to do with St Swithin but we never found it. Managed to eventually find a cafe – my first cappuccino for nearly two weeks and we were under charged which made it better. Back to ship but fell asleep and woke up too late to go out again to see the little market that had sprung up after lunch. 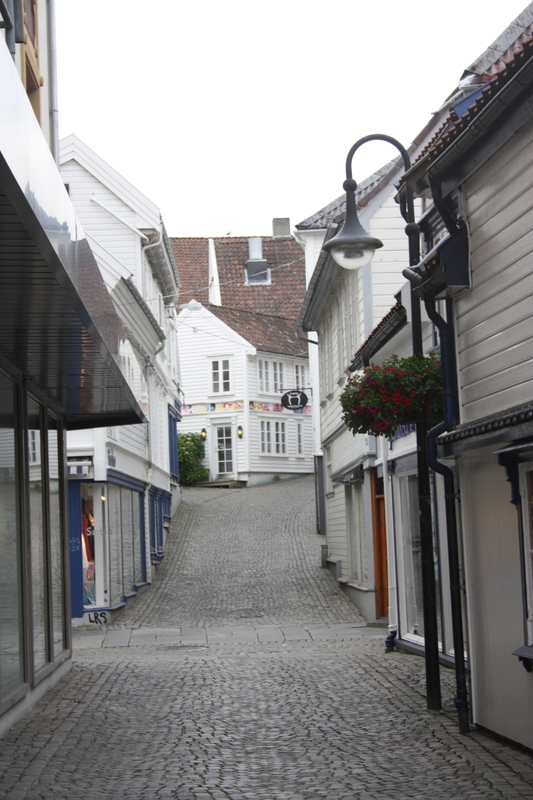 Why goto Stavanger on a Sunday when everything is closed and the locals can’t be bothered to open or are not allowed to open? Sail away party on deck more popular than ever with lots of flag waving and rousing sing a longs – could it be something to do with the round the world cruise prize some is going to win being announced? Me thinks so. Anyway, we didn’t win, it was someone who was travelling in a suite so grumbles by some. Headliners dance group did another excellent show, how do they remember everything? Our last full day. The flower in our cabin’s room has been taken away, we have our dis-embarkation instructions and we are just now has beens! What a day to get back ache. Still managed to get in a two-mile walk around deck 3 though which I must admit helped. Not a lot else to do other than to pack in the afternoon. Last meal in the Meridian and then the show in the evening and visit to the Crow’s nest for a final drink. A tad rough again on the sea but nothing like the trip up from Dublin earlier. Strange that the captain’s log delivered to us did not mention the force 8 winds we went through. Clocks back one hour tonight and up early. Disembarkation scheduled for 09:45 but breakfast at 06:45 and vacate cabins at 08:00. Disembarkation OK and baggage found easily. John & Dierdre have a wait for their taxi to the hotel as it was supposed to pick them up at 09:30. Bye bye Arcadia and hallo long wait until flight home at 19:25 from Gatwick. Just missed the 10:13 from Southampton to Gatwick to had to settle for one an hour later. Weather much better than on journey down and I can now confirm that Arundel Castle still exists. Arrived too early at Gatwick for Flybe to get their act together to book our luggage in so spent a couple of hours in Cafe Nero, slowly having lunch. Arrival home – end of holiday No. 2. More in August.